In the previous post we saw how we could project polyhedra into the plane, and use some simple properties about planar graphs to classify all the possible Platonic solids. In this post we’ll finally get to the buckyball, by considering a less restrictive class of polyhedra: the fullerenes. The Platonic solids were extremely regular: every face had to be the same, with all angles and side lengths the same, and the same number of faces meeting at each vertex. In a Fullerene we allow the faces to be either pentagons or hexagons, but we require exactly three faces to meet at each vertex. We can still take a one-point projection and get a planar graph: it’ll be 3-regular from the vertex condition, and every face has degree five or six. 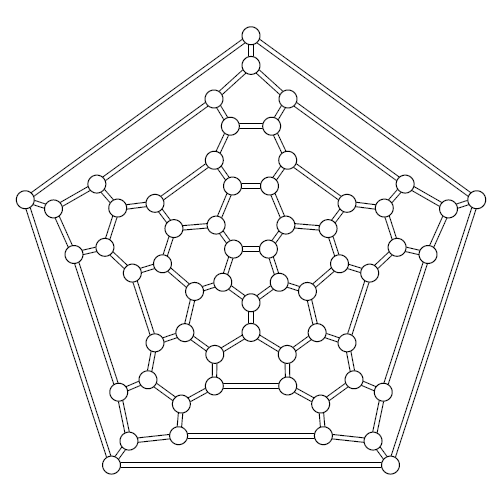 A fullerene has exactly twelve faces of degree five. 3V=2E=5P+6H=5(P+H)+H = 5(2+V/2) + H.
This tells us that V=2H+20, so H = V/2 -10. As P + H = 2 +V/2, we conclude P = 2 + V/2 – H = 2+ V/2 – (V/2 -10) = 12, as claimed. 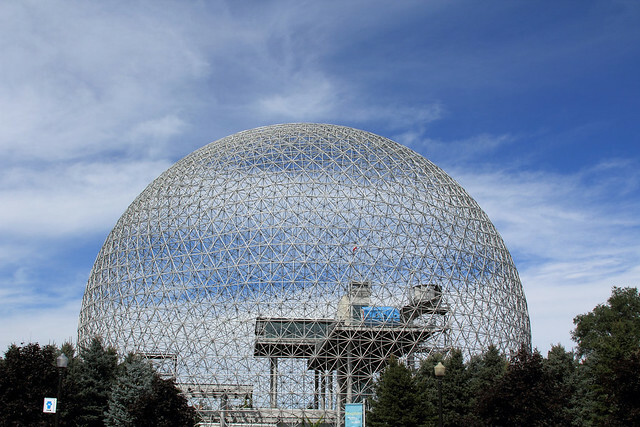 From my travels: The Montreal Biosphere, the largest of Buckminster Fuller’s Geodesic Dome constructions. These are the namesake for Buckyballs, but are not actually fullerenes! They also produced C70, showing that C60 was just one instance of a general class, the fullerenes: they received the 1996 Nobel prize in Chemistry for opening up this field of study. It has subsequently been shown that C60 is naturally occuring – it can be found in soot, created by lightning, and has even been identified in clouds of cosmic dust! 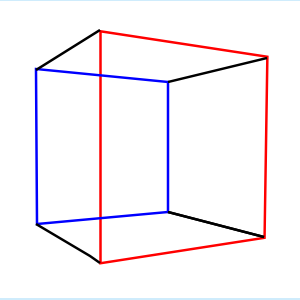 A cube in two-point perspective. How can we represent a 3-dimensional object such a cube in only 2-dimensions, such as on a flat piece of paper? This is the problem of projection, and it inevitably introduces inaccuracies. Different choices of perspective will alter what features survive the projection process. For instance, a perfect cube has all faces square, with corner angles of 90 degrees, and opposite sides of each square are parallel. But in the two point perspective shown only the vertical lines remain parallel; the introduction of vanishing points has distorted the horizontal ones and thus the angles. Instead of thinking of the cube as a solid object, we can describe it in terms of its vertices (the corners or points) and the edges that join them – that is, as a graph! But in the previous post we were interested in planar graphs, and in our 2-point perspective we have edges crossing. This might seem unavoidable – the `front’ blocking our view of the `back’ – but through a different choice of projection we can get a planar graph of the cube, or indeed any suitably well-behaved solid. This is the key to using graph theory to study those solids. Earlier this year I was involved with the construction of the `Giant 4D Buckyball‘, as part of the University of Edinburgh’s Innovative Learning Week. The sculpture was actually of something rather more complicated – the Cantitruncated 600-cell – but buckyballs (in various representations) were a fundamental building block. So, what exactly are they? Julia’s description gives a good overview of the geometric route to the buckyball (and onwards to the full sculpture). But one of the wonderful things about mathematics is that there are often multiple routes to the same place, with seemingly disparate sub-disciplines actually being the same idea in disguise. So my first exposure to the buckyball came not from thinking about physical geometry, but the rather more abstract world of graph theory. In this post I’ll describe the first step along this alternative route, planar graphs. Some of my work will once again be included in the art exhibition at the Joint Mathematics Meetings– a selection of stills from my video project x<–>t, which I described on my main site here. The image above is a more recent rendering using the same ‘strip photography’ technique: it captures the changing behaviour through time of the chaotic pendulum I wrote about a few years ago! My third paper on the Mahler measure problem has been accepted by the Electronic Journal of Combinatorics, and is available here freely under the E-JC’s open access policy. This is joint work with Gary Greaves, and completes the proof of Lehmer’s conjecture for matrices with entries from rings of integers of quadratic extensions: a project that has spanned five papers and two PhDs between us! 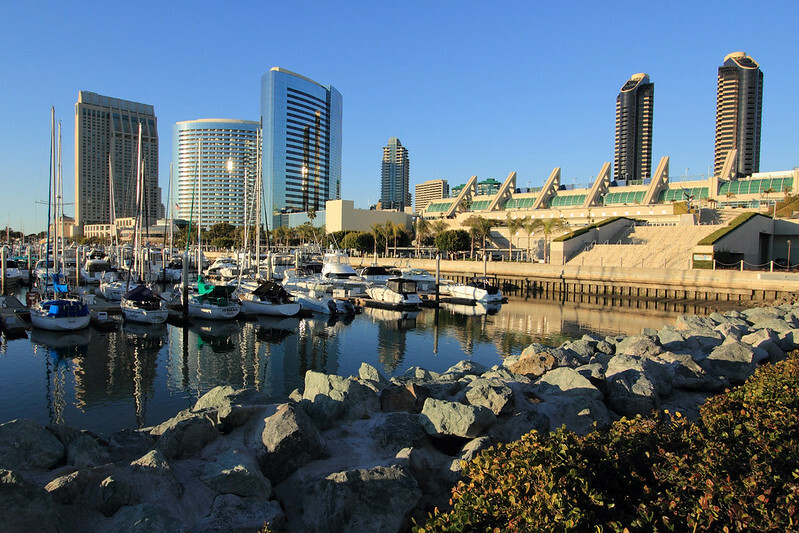 The San Diego Convention Center, home to the 2013 Joint Mathematics Meetings. Earlier this month I attended the 2013 Joint Mathematics Meetings, trading freezing Britain for sunny San Diego! This was the 119th annual meeting of the American Mathematical Society, the 96th of the Mathematical Association of America, my third trip to the US for a JMM, and the first at which I’ve given a talk. 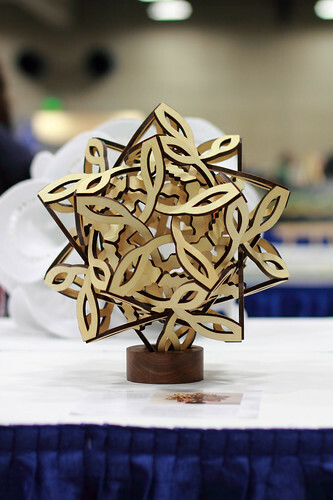 There are also sessions organised by the Association of Women in Mathematics, the National Association of Mathematicians, the Association of Symbolic Logic, and the Society for Industrial and Applied Mathematics, and with over 6500 people in attendance, no shortage of topics to hear about! One of the things I love about these meetings is that in addition to the sessions that you’re involved in, you have an opportunity to attend events that catch your interest, but you couldn’t normally justify travelling to on their own. Two years ago, I gave a complete rundown of my schedule for my first JMM; this year I thought I’d pull out some highlights. As a photographer I have a particular love of architectural subjects. But even without a camera in hand, I can spend many a happy hour wandering an unfamiliar city absorbing its particular style (conversely, few things will put me off a place faster than ugly buildings – 60’s brutalists, I’m looking at you!) However, I don’t generally know much about what I’m looking at! So I was pleased to find a trio of consecutive talks in the MAA Session on Mathematics and the Arts of an architectural bent. One of the speakers turned out to be the author of a book – Mathematical Excursions to the World’s Greatest Buildings – which I received for christmas and am very much looking forward to diving into; and another also presented a series of locations used an examples in a course on multicultural mathematics. Perhaps it’s time for me to revive my mathematical tourism efforts! Most intriguing, though, was Frode Rønning’s talk on the Dutch Benedictine monk Dom Hans van der Laan, who sought to find theoretical underpinnings to architecture. His study of the limits in our ability to perceive differences in proportion in the context of 3-dimensional space led him to the plastic number: the real solution to P+1=P3. Much has been made of the alleged aesthetic qualities of its more famous cousin, the golden ratio; that is a solution to &Phi+1=Φ2. Another characterisation of the golden ratio is that it satisfies Φ-1=1/Φ the plastic number is similar in that P-1=1/P4. A number is called morphic if there are positive integers m and n such that x+1 = xm and x-1=x-n; the golden ratio and plastic number are both morphic, and in fact, they are the only morphic numbers! But my own connection to this number is through Mahler measure; in my work, it has only been necessary to study non-reciprocal polynomials, because it is known that the Mahler measure of reciprocal polynomials is bounded below. What by? The plastic number! `Superfrabjous’, by George Hart – from the art exhibition at the 2013 JMM. Continuing with the artistic theme, I as usual enjoyed the art exhbition (although I didn’t find the time to contribute a piece of my own). Sculptural work, such as shown to the left, always has immediate appeal for me, but there were some strong printed works this year too. Particularly striking were Daniel Gries’ Fractal Cylinder renders: there are lots more of these here, and the code to generate new examples is also available. As beautiful as they are on-screen, they’re even more impressive as a decently-sized and properly mounted print. I was also amazed to find that Charles Redmond’s Starry Pines was a purely generative work, using something called the Context Free Art language, which I’ll have to look into. Finally, I found myself repeatedly returning to Etienne Saint-Amant’s WABE: Broken Perspective. I attended a couple of talks of a game-theoretic flavour in the AMS Special Session on Mathematics and Social Interactions. Angela Vierling-Classen examined the issue of gendered division of parenting, demonstrating models in which, even if both parents value equality of effort and it forms a valid Nash equilibrium, most starting states converge to equilibria with unequal assignments. Thus it’s not enough to want equality – you have to commit to it from day one! Her presentation also touched on some of the difficulties in publishing highly mathematical work in sociology journals. The other looked at ‘sacred values’, and how inviolable ties between players in adversarial evolutionary games could lead to new outcomes compared to models in which nothing is sacred. In particular, criminal gangs were able to persist in a game which otherwise tends to a crime-free utopia, as players may be compelled to act against self-interest in support of the gang, or alternatively may benefit from allegiance to such a group by way of protection from other criminals! Loosely on the subject of sacred values, this session also hosted a talk that has surely the strangest abstract I’ve ever seen at a conference; tragically I couldn’t make it to the event, so feel I shouldn’t dismiss it outright as nonsense, but, well, take a look for yourself. Is anyone brave enough to buy the book? 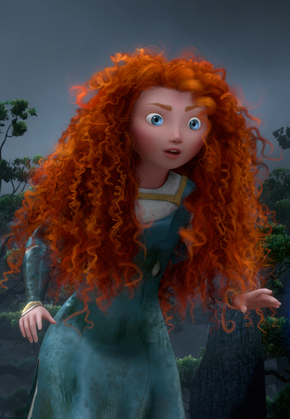 Tony DeRose discussed some of the challenges of animating Merida – or rather, her hair! Instead, I opted for the MAA Invited Address, How mathematics has changed Hollywood by Tony DeRose from Pixar. Obviously this was a visual treat, with behind-the-scenes (as it were) footage from Monsters Inc, Finding Nemo and Brave. Originally, handling physical constraints like the effects of gravity or momentum, or preservation of volume, were simply down to the animators; trying to implement real physics into the rendering systems introduces all kinds of difficulties when reality clashes with artistic vision! This causes both entertaining mathematical out-takes, and the need for creative solutions. For instance, Merida’s hair – which Tony describes as practically a character in itself – could not be implemented as individual strands, or it would whip around impossibly violently. To get the right mix of softness under low acceleration, whilst holding shape under high acceleration, a system was devised where curls are loosely coupled to a stiff core. Whilst no-one has hair like this, it paradoxically looks more realistic! Similarly, the robot Wall-E performs manoeuvres that would tear apart a real machine of that size; and no human is built like Mr Incredible! For Pixar, then, realistic physics is just the beginning – not an end. More technical detail was given in the context of a problem known as surface subdivision: a seemingly simple process of splitting and averaging raises interesting questions about its behaviour in the limit, with limit curves ranging from smooth, differentiable shapes to nowhere-smooth fractals: which can nonetheless be easily animated! Impressively, Pixar have made all this work freely available as the open source library opensubdiv, and indeed have a research arm that produces academic publications and technical memos. DeRose is also clearly passionate about enthusing young people about STEM topics, and spoke a bit about his involvement with Young Makers, which supports Maker Faire-style projects. There has been a long-running Art of Pixar travelling exhibition; plans are apparently well underway for a corresponding Science of Pixar in collaboration with the Museum of Science in Boston. I’ll be looking out for that. The invited addresses were linked to extended sessions on the same theme, with additional speakers- for De Rose’s talk, this was the MAA Invited Paper Session on Mathematics, Computer Graphics, and Film Production. I only had time for one of the talks, Tim Chartier’s Animating Class with Computer Graphics. But if I ever find myself lecturing linear algebra, I’d be highly tempted to use some of his ideas on illustrating matrix operations through their effects on graphics. Working in Matlab, linear transitions between two source images can be used to create animated tricks like invisibility or teleportation. Splitting images into separate matrices for each colour channel then manipulating them can give Warholesque artworks, or apply effects akin to Instagram or Photobooth. In fact, Chartier is a mine of ideas for making undergraduate education more engaging (a theme that is picked up in many other sessions), and gave an MAA invited address himself, Thinking Linearly about Data. This focused largely on the questions of ranking and clustering of data – but whereas such talks normally look at Google’s pagerank, or recommendation tasks like the Netflix prize, this talk was new territory for me, tackling sports rankings. I have to admit that I was held back slightly by my complete lack of insight into the worlds of basketball and american football, but for US students these are relatable topics, and the mathematics is rather more accessible. Indeed, one of the ranking systems for american football was devised by an undergraduate! Best of all, students can take what they’ve learnt, make their own tweaks, and apply it successfully to a real-world problem. March madness is a highly popular basketball tournament, and literally millions of predictions as to who will be eliminated when are made by ‘bracketologists’. Using graph theory and linear algebra, undergraduate mathematicians have managed to out-perform sports `experts’ and win bracketology contests. There’s a writeup (and video version) of a previous MAA talk by Chartier on all this here. The linked session, Thinking Linearly about data was just one of many I attended that looked at social network analysis, big data, and often both: other sessions included the AMS-MAA-SIAM Special Session on Research in Mathematics by Undergraduates and Students in Post-Baccalaureate Programs, the MAA Invited Paper Session on Mathematics in Industry, and the MAA Session on Mathematics Experiences in Business, Industry and Government. This seems to be quite the hot topic at the moment, and it was great to hear from a range of practitioners from outside of academia, and to see that even undergraduates are making progress in this area. There were talks on data forensics by mobile phone providers trying to detect the new identity of former customers; more on sports analysis; the challenges of performing even simple tasks like triangle-counting for clustering when data sets are several terabytes in size; the perils of `weapons of math destruction’, whereby metrics are used inappropriately and detrimentally in contexts as diverse as credit scoring, teacher evaluation, and medical insurance; assessing the efficiency of transport networks; and using community detection for understanding the brain. All excellent food for thought! There were many other talks, from a variety of sessions, that I attended: but since I claimed this would be a selection of highlights rather than a full log, and is weighing in at 2000 words, I think I’ll stop here!